Ever since I got this electric pressure cooker, I've been eating a ton of butternut squash. 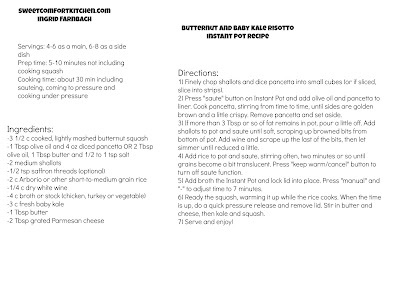 You can cook it whole, no cutting or peeling necessary until it's soft, as per this wonderful page (though I find I like it done with more time, more like 18 to 20 min for a whole butternut. 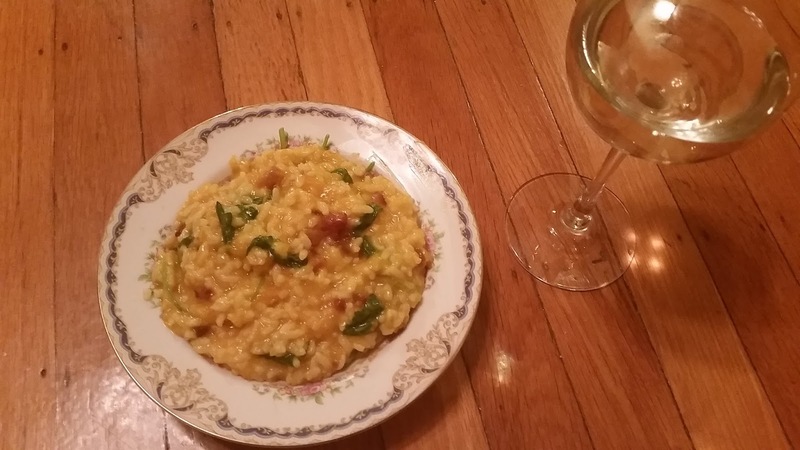 Risotto, it turns out, is a breeze in the pressure cooker, saving just a few minutes but requiring a lot less focus and attention. You do have to have the final ingredients at the ready to stir in quickly at the end. However, you can walk away from it for much longer than you can a pot on the stove. Most of the recipes I found for the PC required cutting and peeling the thing ahead. Um, no. 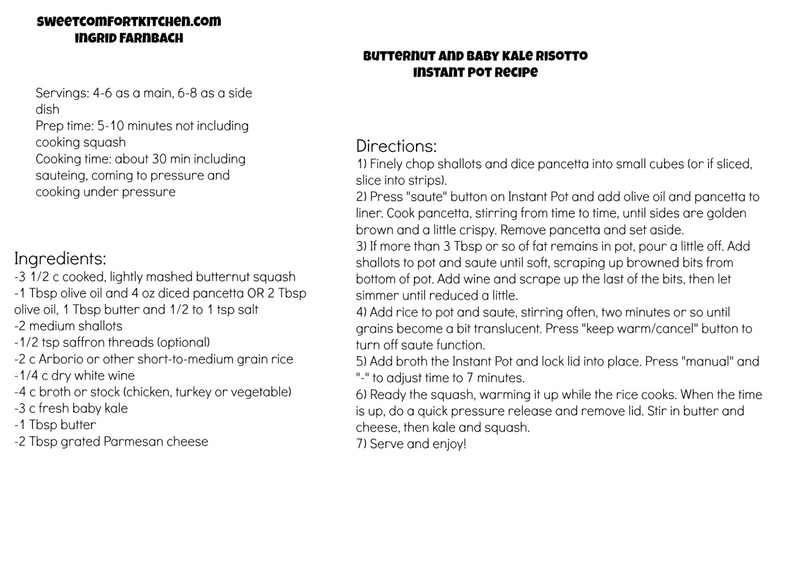 I found a Barefoot Contessa recipe that added the squash at the end and adapted it with some help on timing from hippressurecooking.com. Try that one if you don't have a pressure cooker! After a few experiments, I found that I really prefer the squash soft so it almost melts into the risotto rather than staying in cubes, but you can leave it in cubes if you like it that way. 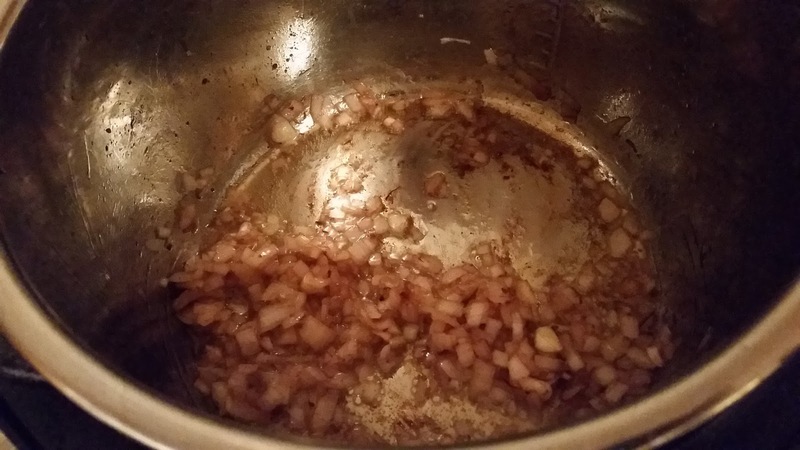 I also made the mistake of using fabulous homemade chicken broth (also a breeze with the Gizmo and some 99 cents a pound chicken parts from the butcher) the first time around, so before "publishing" I had to make it that way again. -chicken or veggie broth, preferably homemade, but you could use canned, or even water and a bouillon cube if you reeaaalllly have to. 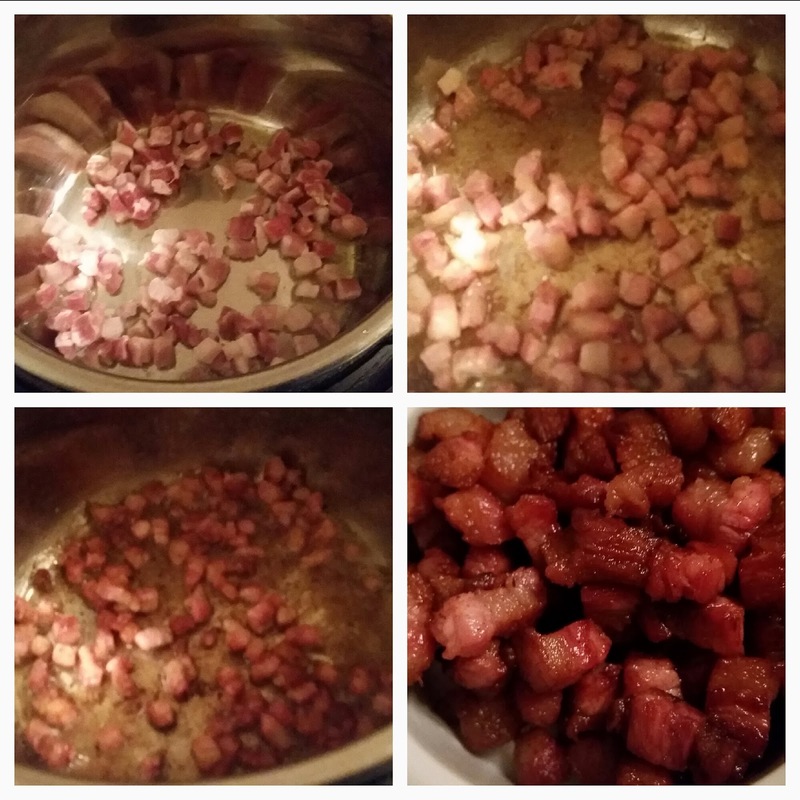 If using pancetta, brown that first in olive oil. If not, replace pancetta with more olive oil and a little butter and salt - see recipe card). Press the saute button on the Instant Pot after adding 1 Tbsp olive oil and 4 oz finely diced pancetta. Saute, stirring frequently, 3 to 5 minutes until nicely browned. Remove pancetta pieces and set aside until the end of the process. Add two finely chopped shallots to the pot, stirring frequently until soft - I know this seems like a lot of stirring, but it's MUCH less than in a traditional risotto. Add 1/4 cup, y'know, ish, of white wine and stir while scraping up any remaining yummy brownish bits from the bottom of the pot. 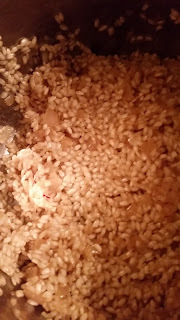 Add 2 cups arborio rice to the pot and stir for a couple of minutes, until the rice starts to look translucent around the edges or a little more. You can't quite see it here, but it's happening! This step of sauteing the risotto is supposed to be what helps build the creamy texture, whether or not you stir constantly. 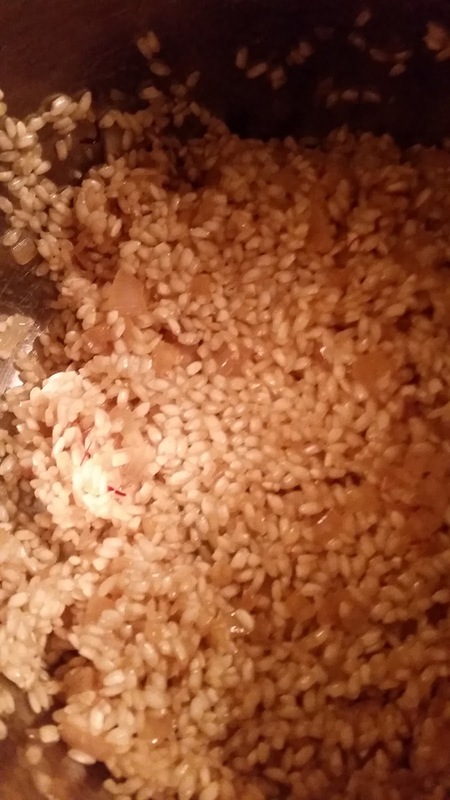 Once the rice is looking a bit translucent, stir in 4 cups broth and turn off the saute function by pressing the "keep warm/cancel" button. Lock the lid into place and make sure the valve is set to "seal" - it's the position where it's pointing more toward the back. 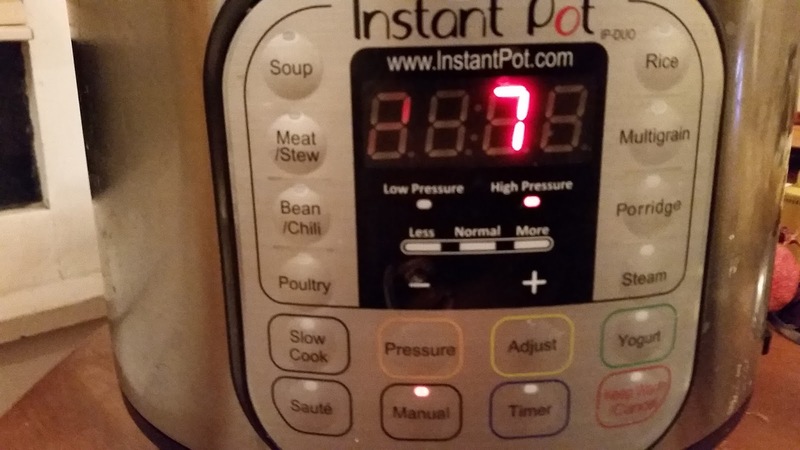 Press "manual" and "-" to adjust down to 7 minutes. Between the time it takes to come to pressure and the 7 minutes to count down from there, you've got about 20 minutes with no stirring. Yay! However, you'll need to stir in the remaining ingredients very quickly once that time is up, so get them ready before you get lost in your favorite show. Once the time is up and the beeper goes off, do a quick release of the pressure by carefully turning the valve to venting. Press "keep warm/cancel" again to turn off. 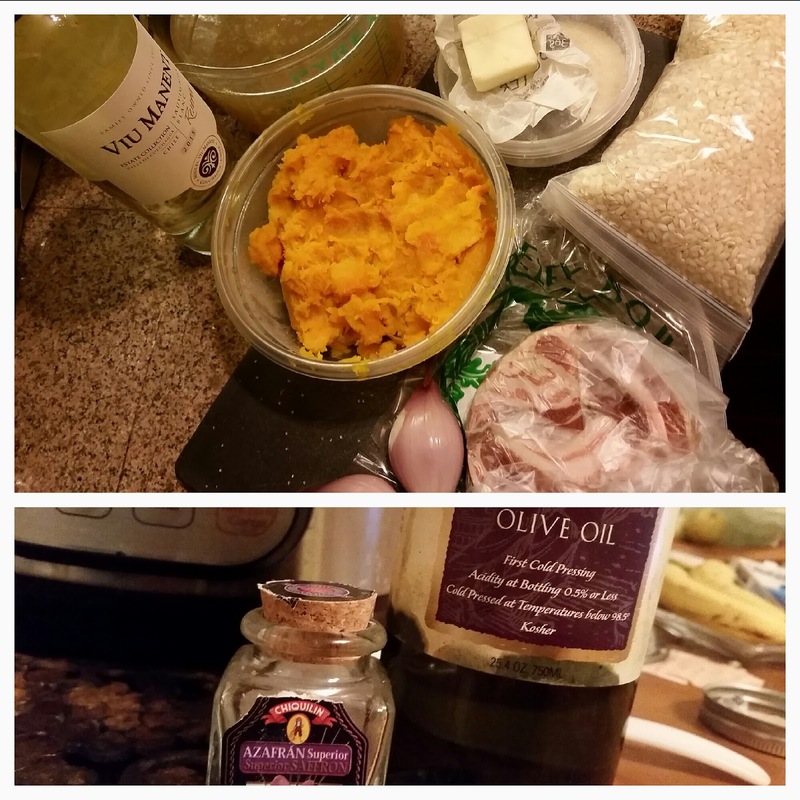 Stir in 1 Tbsp butter and 2 Tbsp grated Parmesan, then 3 1/2 c mashed butternut squash and 3 c baby kale. Remove inner pot from the heating element and put on a potholder or trivet. 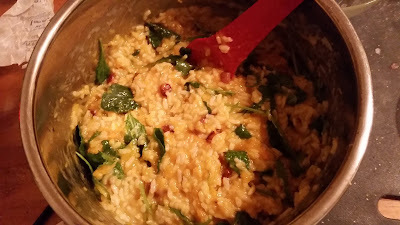 I'm making mushroom risotto tomorrow night (also a twist on an Ina Garten recipe). Since I just got my Instant Pot and haven't had time to even open the box yet, I'm unsure whether to give it a go or go old-fashioned. Since morels are involved I'd hate to mess it up. Thoughts? I love the idea of not standing over the stove the whole time!! Also, this looks delicious! Will definitely try it! I totally committed one of the comment sins. I'm making this, but totally different, think it'll work? 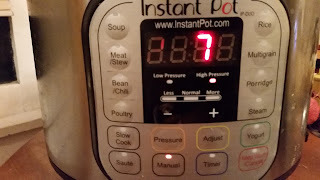 ;) Really, I'm just scared to use the Instant Pot!